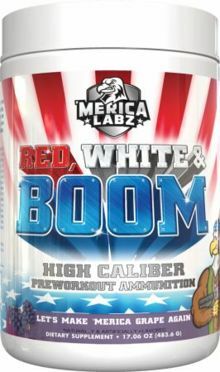 Merica Labz Red, White & Boom: The Patriotic Pre Workout! Mix 1 scoop with 10-16 ounces of water and consume approximately 15-30 minutes prior to your workout. To assess tolerance, new users may want to start with 1/2 scoop. This product is only intended for use in healthy adults 18 years of age or older. Pregnant or nursing women should not use this product. Consult your healthcare provider before useing this product, especially if you are taking any prescription, over the counter medication, dietary supplement product, or if you have any pre-existing medical condition including but not limited to: high or low blood pressure, cardiac arrhythmia, stroke, heart, liver, kidney or thyroid disease, seizure disorder, psychiatric disease, diabetes, difficulty urinating due to prostate enlargement or if you are taking a MAOI (Monoamine Oxidase Inhibitor) or any other medication. Discontinue use and consult your health care professional if you experience adverse reaction to this product. Do not exceed recommended serving. Do not use in combination with caffeine or any stimulants, including but not limited to, coffee, tea, soda, and other dietary supplements or medications. Do not use under extreme conditions of heat, sleep deprivation, extreme cardiovascular exertion or dehydration. Do not combine with alcohol. Do not use if safety seal is broken or missing. Keep out of reach of children. High Caliber Preworkout With Explosive Energy! Life, liberty, and pre-workout energizing mega-crushfests – the American way. You know the feeling you get on Veteran' s Day, watching the American flag nobly twist in the wind, while a true patriot belts out the Star Spangled Banner? Yeah, us too. So we mixed it with some wicked stims, some performance modulators, and bottled it.